I make this frosting to go on my sour cream chocolate cake. I recommend you use a mixer to beat the frosting. You can do it by hand. However, using a mixer causes the frosting to be lighter and fluffier than it will if done by hand. Mix the butter and the cocoa powder. Add the powdered sugar and stir in. Stir in the sour cream and vanilla extract. With a mixer, beat everything until it is smooth and spreadable. 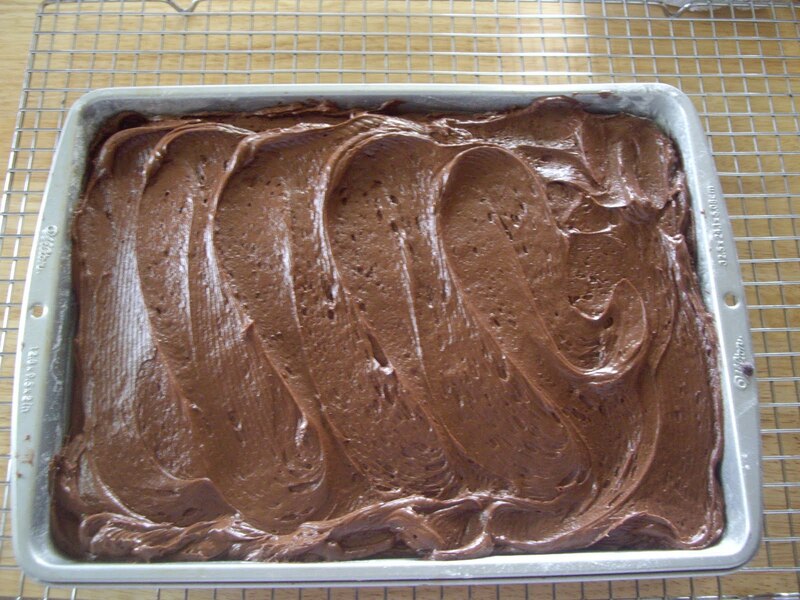 This will frost a 13″x9″ cake or will frost and fill a 8″ or 9″ double layer cake. This is a great glaze for your cookies. It dries shiny and hard so it’s great for decorating after it sets up. And it does set up pretty fast. It is not completely opaque so is really great for food coloring additions. Whisk all the ingredients together in a bowl. The glaze should be somewhat thick, but spreadable. To make sure it is the right thickness, do a test cookie. Spread it over the cookie and let it set for about 30 seconds to a minute. The glaze should settle smoothly over the cookie. If it is too thick to smooth out, add a tiny bit of milk, about a teaspoon and stir that in and test it again. When you have the right consistency, glaze all your cookies. They will harden up in only a few minutes. This will make about 2/3 cup and will frost about 2-1/2 dozen cookies. Double the batch for large cookies or for a lot of them. Here is the recipe for the frosting for the chocolate drop cookies. Heat the chocolate and margarine over low heat until melted. Take off the heat. Stir in water and powdered sugar until smooth and spreadable. If you have cocoa powder, but not chocolate squares you can substitute. You will need 6 Tablespoons of cocoa powder and 2 Tablespoons of shortening or cooking oil.